How can law firms drive greater operational efficiency and prepare for the future of law? 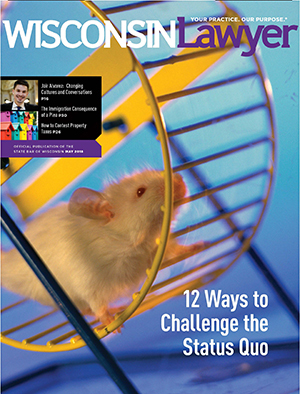 One thing is certain, the desire to challenge the status quo must start at the top. Here are 12 practical starting points. Most law firms recognize that the legal market is changing. Most also believe that the business of law must evolve too, to meet changing client demands and grow the business. To do so, all of the many business processes and procedures involved in running a law firm merit evaluation for improvement, in order to be more profitable. With so many variables that can affect the firm business, it’s hard to decide where to begin. There are recent examples of companies in other industries that failed to see the business risk of status quo thinking, such as Blockbuster missing a huge opportunity with Netflix. There is also the cautionary tale of Eastman Kodak’s costly digital camera mistake of simply doing something different as opposed to doing the right things differently. Law firms are no longer able to be technological laggards that are resistant to change. The business challenges and pace of change, as well as new opportunities that didn’t exist years ago, make it a necessity. Modern law firms are demonstrating exemplary creativity in legal problem-solving today. The majority of this problem-solving stems from simply looking beyond status quos and refusing to accept that this is as good as it gets. In our discussions with hundreds of law firms from around the world, we see examples of status quo thinking in various forms, stemming from finance, culture, and legal technology. These do not all apply to every firm, but for those firms looking to build a sufficiently attractive case for change, the following 12 alleged status quos represent practical starting points. Aderant – the company behind the 2017 Aderant Business of Law and Legal Technology Survey from which this report derives – proposes a well-reasoned approach is to challenge status quo thinking in law firms. This means examining why law firms execute business processes, as an exercise in identifying areas for driving operational efficiency and preparing the firm for the future of law. Status quo bias. Sometimes things are done a certain way because it’s the best practice. Other times we do things without a thought to process improvement. After all, humans are creatures of habit, and we gravitate toward the familiar. The familiar is known, and believed to be safer than what is new or different. This is known as status quo bias. When things are sufficiently attractive to make a change, it’s probably already too late. Discomfort is a leading indicator. The current legal climate, which is squeezing law firms between market pressures and growing costs, is at the very least uncomfortable. Maintaining the status quo is a form of risk aversion, and it serves a purpose in a static environment. Business, on the contrary, is dynamic and fueled by innovation and change. This is where the two intersect and how status quo thinking introduces business risk. Blockbuster, for example, was the dominant movie rental store of its day. It resisted the innovation of streaming media, in preference for its brick and mortar locations. In 2000, Blockbuster reportedly had an opportunity to buy Netflix for a mere $50 million. That same year it also earned 16 percent of its revenue – $800 million – from late fees. How do you cultivate innovation in a traditionally risk-adverse legal profession? Where do you begin? Start by asking, “Why?” Last year’s Wisconsin Legal Innovators did just that. Jump to the sidebar below. The incentive to change was not sufficiently attractive compared to the existing benefits of maintaining the status quo. Slowly but surely, the market evolved over the course of a decade. By the end of 2010, the rental movie store giant filed for bankruptcy. Meanwhile, Netflix revenue was set to top $10 billion by the end of 2017. It’s easy to be lulled into the idea that the status quo is simply a refusal to accept and respond to change. It’s deeply rooted in the culture of an organization. There is a wide difference between doing something different and doing the right things differently. The Eastman Kodak case study is instructive here. The company invented the digital camera in 1975 but filed Chapter 11 bankruptcy almost 40 years later. Many observers say the bankruptcy was a consequence of the digital evolution in photography, but real wisdom is buried in the nuance of the company’s fall. The next decade has the potential to distinguish between those law firms that adapt and evolve, and those that maintain the status quo and emerge in a weakened state. Kodak did eventually emerge from bankruptcy, albeit as a much smaller company. So, surviving the status quo is possible, if emerging in a weakened state is an acceptable business outcome. The parallels to the legal market are stunning. The legal community is ripe with technological innovation. Corporate clients are demanding greater transparency, efficiency in work, and predictability in costs. Law firms face pricing pressure and competition from new sources – even as the market grows more competitive and demand remains flat. Lawyers have a lot to say. Our authors are no exception. Whether its personal, insightful, or fun, it’s always interesting. If the 2008 recession is widely considered the catalyst for transformation in the legal community, we are now entering the 10-year mark. The next decade has the potential to distinguish between those law firms that adapt and evolve, and those that maintain the status quo and emerge in a weakened state. Law firms tend to get labeled as technological laggards that are resistant to change. That might have been true 10 years ago, but that generalization does not reflect our recent experience. Modern law firms are demonstrating exemplary creativity in legal problem-solving today. We saw this as a common denominator in the 2017 Aderant Business of Law and Legal Technology Survey. For example, almost half (47 percent) of respondents said who they collaborate with inside a law firm is different today than it was five years ago. This illustrates how the front office and back office are becoming more tightly integrated into the pursuit of identifying creative legal solutions. The problem that remains is some firms still stick to the familiar even in the effort to think creatively. For example, when asked on the same survey which technologies are most effective, law firms instinctively selected document management (66 percent). You need to ensure that work is done only once instead of multiple times, in different ways, by various people. Document management is undoubtedly a productivity-enhancing tool. It’s also very tactical, rather than transformative. In our discussions with hundreds of law firms from around the world, we see examples of status quo thinking in various forms stemming from finance, culture, and legal technology. These do not all apply to every firm, but for those firms looking to build a sufficiently attractive case for change, the following 12 examples of status quo thinking represent reasonable starting points. Aderant research indicates that on average, about one-third of the law firm revenue comes in the final month of the year. This is because law firms tend to make a massive push at the end of the year to draw in collections. This creates several problems. First, it introduces cash flow challenges for the first few months of the year, as cash gained in December often goes to annual expenses and payouts. Law firms can see this in their metrics like work-in-progress (WIP) and the average age of accounts receivable (A/R). Finally, when an entire law firm is focused on the year-end push, it’s not doing other important strategic activities such as planning, business development, cross-selling, or even software and system updates (which are important to contemporary cybersecurity measures). Breaking this status quo begins with a focus on building efficient processes to identify and prioritize accounts outstanding and develop a systematic approach to collection. This should include aspects such as the automation of collection letters and billing-partner escalation. Firms that do this well are proven to bring down the average time to collection and flatten out revenue earned month-to-month. In turn, this provides better predictability in law firm finances and improves cash flow and profitability. Running a successful law firm takes business savvy, because you must strike the right balance between revenue per client and costs. This margin is the key to maximizing your firm’s take-home dollars. Managing that equation can seem straightforward: If you want to boost your revenue, you simply bring in more clients. But simple isn’t the same as easy. In fact, every client comes with cost. And some of those costs are invisible to many partners and directors. That’s because most firms are managing a complex infrastructure behind the scenes. For example, say you’re a partner who’s prepping for a client meeting: you need to present the latest information, so you send out inquiries to your team. They pull billing information from the financial system. They check the timekeeping system to validate hours spent and remaining. They look at case documents and calendars to understand the next steps. It takes input from a lot of people to build a complete picture. Once they report back via emails and Excel spreadsheets, an assistant or paralegal pulls together client-facing reports to bring with you. After the meeting, you return to the office with new information and to-do items. So, you send more emails to update each system and assign new tasks. This process is far more sophisticated than the paper records of the past, and that’s thanks to all your efforts in digitizing your timekeeping and document storage and billing. But while this model has served you well for years, the legal landscape is changing. And many firms find that their infrastructure is starting to strain under the pressure. The natural reaction to these pressures is to drop rates so you can keep your clients, but that makes it harder to maintain or grow your revenue. Firms that develop a collective responsibility for technology are more prone to remain current on updates that support productivity and security. In response, many firms push to make up the difference by bringing in more clients. To support them, you need more infrastructure – more labor and servers and tools. All these additions look like growth, but they actually create more complexity and cost. And worst of all, this entire environment can be insecure to the growing risk of cyberattacks and data loss. The bottom line – when you combine rising costs and risks with this shrinking revenue, you’re going to have to work twice as hard tomorrow for the same or even less take-home pay than today. You must streamline and consolidate access to your critical business and practice information. And you need to systematically standardize best practices across the firm – not just for legal work, but also for billing and information security. As a result, you can take on more clients and cases without bloating your infrastructure. That means you’ll better serve your clients while increasing the firm’s take-home pay. Law firms tend to generate pre-bills monthly. Large law firms can generate several thousand pre-bills even if they have no intention of actually invoicing the client. Those firms may have quarterly, annual, or even contingency fee arrangements in place. In 2015, Aderant analyzed billing metrics from 50 law firms and found this practice is surprisingly common. Some firms said this happens with half of all their client accounts and a few said it was true 80 percent of the time. Essentially, these law firms are using the monthly pre-bill process to get a status check on work-in-progress (WIP). This comes at an incredible expense considering the time, resources, and effort that goes into the pre-bill process. More importantly, it’s completely unnecessary because a modern law firm billing system puts this information at a partner’s fingertips. There’s no need to even send an email requesting a report because these can be generated with a click of the mouse or the touch of a screen. In the business of law survey, many respondents said most clients preferred hourly billing to alternative fee arrangements (AFAs). They suggested that many corporate counsel were first trained in law firms under a billable hour structure. The status quo that has emerged is to simply offer a discount. For instance, when a client asks about AFAs, the law firm offers a 15 percent discount. What clients are really after with AFAs is predictability in legal budgets. Firms that buck this status quo and make an effort have an unprecedented opportunity to build stronger client relationships. It starts by understanding costs such as having one expert witness versus three or getting a good sense for what the average deposition requires regarding time. Research suggests that while a lot of firms have experimented with creative pricing – a median of 14 percent of client accounts are structured under alternative fee arrangements – they haven’t exactly dived in with enthusiasm. Some law firms resist AFAs because they perceive these as unprofitable. That probably has more to do with the fact that alternative pricing strategies are still emerging as a discipline. AFAs that are unprofitable imply an insufficient understanding of the costs to deliver the service – or an inability to manage the costs effectively. Whether or not clients truly want AFAs, they are still inviting the conversation. Law firms that focus on data collection can develop the capability to accurately price AFAs. Imagine the competitive advantage of the law firm that responds to such a request with a confident prediction of costs for the client and profitability for the firm. It’s not unusual for an attorney to complete a legal task for a client on the second day of the month, but delay making a time entry until 20 days later. It’s challenging to remember what one did yesterday, let alone two or three weeks ago. It’s possible to reconstruct the time by looking through emails and notes, but studies suggest this leads to under billing for fear of overcharging a client. Partners can’t describe for clients the status of WIP until the end of the month. Pre-bills are delayed or inaccurate, which slows invoices. Invoice delays have an adverse impact on cash flow and profit. No other industry in business operates this way – it just is unacceptable anywhere else. A law firm that wants to improve margins can do so by improving the ability to capture time, in real-time, which requires easier ways for the fee earners to take action. An invoice dated the first of the month may not actually be sent to a client until three weeks later. In the business of law and technology survey, more than 90 percent said their firm spends too much time during the billing and invoicing process. Reducing the time to get bills out the door is entirely possible. Twenty-five percent of firms surveyed say their firm completes invoices in one week or less – and 11 percent do it in just 72 hours or less. Every device, in every hand at a law firm with access to the web, is a potential entry point into a law firm’s systems. These firms have implemented automation that automatically routes pre-bills through review and approval and supports paperless initiatives. They have found ways to remove the expense of excessive clicks and touches from the pre-bill processes. An Aderant firm recently reported that with the automation, the amount of time their fee earners spent reconciling their billables dropped from between seven and eight hours to between 30 minutes and one hour. One reason some partners scribble down time entries on sticky notes and pass them off for someone else to enter is that they have little involvement in technology decisions. Whether that’s by choice or not, the rest of the staff hesitate to disturb lawyers to ask for input. Their involvement throughout the process is crucial if we want them actually to use the technology and realize the full potential. In fact, initiators of major system purchases should actively seek stakeholders from across the firm including attorneys, the IT shop (if you have one), and the department championing the acquisition. This fosters a sense of shared risk and forms stronger internal collaboration. Firms that develop a collective responsibility for technology are more prone to remain current on updates that support productivity and security. Law firms have an inherent need to collaborate because having just one expert working on a project doesn’t scale. To nurture more productive collaboration, firms have begun turning to project management. What is your favorite part of the United States? My wife and I love the Midwest, especially the Twin Cities. We lived on Lake Minnetonka for a few years and really came to enjoy the Midwestern lifestyle. There was a culture shock at first, especially considering the change in weather. But we grew to love the seasons and especially the summers and autumns. Our daughter traveled a lot with soccer, so we were all over the Midwest, from Kansas City to Chicago to Milwaukee and throughout Minnesota. We met a lot of people and developed some great lifetime relationships. Chris Cartrett, Aderant, Atlanta, Ga. Initially, project management was associated with bureaucracy and over-administration, but it has evolved significantly in recent years. For example, many software development methodologies, such as Lean, Agile, and Six Sigma, have been adopted for casework and project management. Improving operational efficiency was second only to pricing among top law firm challenges identified by respondents in the business of law and legal technology survey. This is in part what is driving project management to be a light and flexible process aimed at improving efficiency. When law firms change compensation models to incentivize profitability over billing hours, it is worthwhile also to consider the role it plays with the millennial generation. Research shows millennials place a greater emphasis on work-life balance, ethics, and civil activities than did previous generations. Firm-wide policies on telecommuting and volunteerism are nonmonetary factors law firms should consider when modeling incentives. The replacement or upgrade of a law firm billing system only happens once every 10 or 20 years. The project is significant enough that it has become something bigger than itself: it’s not merely about replacing a billing system, but a once in a lifetime opportunity to invest in the future success of the firm. This is a chance to drive significant improvement across essential law firm processes. When law firm processes – client intake, case workflow, WIP-to-cash – are augmented by technology, it removes inefficiencies that drive up costs. Upgrading a billing system is not just about back-office efficiency – it’s about improving the efficiency for the entire firm. Cybersecurity used to be less complicated: you needed a firewall, some anti-virus software, and a little education to be cognizant of suspicious links in phishing emails. The rest was left to the IT department, which performed nothing short of miracles in protecting firms from cyber attacks. Cybersecurity specialists speak regarding broader surface areas of attack and vectors of attack. This means every device, in every hand at a law firm with access to the web, is a potential entry point into a law firm’s systems. A phone accidentally forgotten in the back of a cab has the potential to be a vector of attack to access confidential law firm data. This makes cybersecurity a business of law rather than merely a technology problem. They say it takes 10-20 years to become an “overnight success” but it takes far less time to fail. By the time sufficient incentives to evolve and change are recognizable, the opportunity may have already passed. This conjures up an important question: Where should the case for change originate in a law firm? A savvy professional in the finance department might have a chance to use data to illustrate the need to challenge the status quo. It’s daunting to stand up to the prevailing wisdom when your role is largely supportive. Certainly, the C-Suite has an opportunity to influence the direction of a law firm. These positions – in strategy, operations, technology, and finance – have all grown out of a recognized need for professional business strategists. However, the task of challenging the status quo is ultimately a leadership responsibility. It requires vision, change management planning, and the courage to see things through. Change must start at the top. Private lawyer Seth Dizard and municipal lawyer Nick DeSiato struck on the idea of using receiverships to deal with foreclosed or nuisance properties in Milwaukee. “Forget how things have been and focus on how things should be,” says Nick DeSiato of the Milwaukee City Attorney’s Office. DeSiato and Seth Dizard of O’Neil, Cannon, Hollman, DeJong & Laing S.C., Milwaukee, struck on the idea of using receiverships to deal with foreclosed or nuisance properties in Milwaukee. Cristina Bordé and her colleagues Maria de Arteaga and Yvonne Geerts noticed the exoneration rate for Latino inmates was disproportionately low compared to that for African American and non-Latino white inmates. Why was that? What could be done? Those questions spurred creation of the Wisconsin Latino Exoneration Program. “Think critically about the segments of the population that are underserved,” says Cristina Bordé of the U.W. Law School’s Wisconsin Latino Exoneration Program. Bordé was inspired to address a gap when noticing there was a much lower number of Latino exonerates than expected given the number of Latinos in the prison population. She reached out to the Latino community to identify the factors that tend to arise in Latino cases that lead to wrongful convictions. Her selection as a 2017 Wisconsin Legal Innovator increased the visibility of her program, leading to requests to speak at events. “It has helped spread our message,” says Bordé. Brian Potts invented LegalBoard™, which has keys for inserting symbols, footnotes, comments, legal phrases, and more with just a quick keystroke, saving time and frustration when typing legal briefs. Brian Potts, inventor of LegalBoardTM, says, “Just work at making yourself and the profession better every day. Often it’s the little things that matter most to people.” Potts invented a keyboard that saves time and frustration when typing legal briefs. “I’m always looking for ways to make life better and to have as much fun as possible while doing so. I have a restless mind. When I settle on a good idea, I can’t stop thinking about it until I take action,” says Potts of Perkins Coie LLP, Madison. Milwaukee Municipal Court judges Derek Mosley, Valarie Hill, and Phil Chavez devised a plan to help reduce the number of people who skipped their court dates by holding walk-in Warrant Withdrawal Wednesdays at the courthouse. To increase accessibility, they then took the court out into the community. Why not? Seth Dizard encourages the legal community to nominate themselves or others for recognition as a 2018 Wisconsin Legal Innovator. Says Dizard, “Fresh ideas are essential to our profession, and we should celebrate those good ideas. Through the “That’s a Fine Idea: Legal Innovation Wisconsin” initiative, the State Bar of Wisconsin is asking the legal community to help it tell the story of legal innovation. Tell us about the people and ideas that are changing Wisconsin’s legal landscape. Nominate a Wisconsin Legal Innovator who breaks with tradition to do it better. The Wisconsin Lawyer will feature the people behind the best examples of legal innovation in the November 2018 issue. Learn more or find the nomination form at ThatsaFineIdea.com. The deadline for nominations is June 30, 2018.